This week was a whirlwind with the first day of school on Tuesday and two days later, Back to School Night. After engaging in a conversation about setting up a classroom environment that is conducive to learning with parents and teachers, I decided to share my classroom space, beginning of school materials and philosophy in setting up a positive learning environment for my students. The set up of my classroom, the colors, decorations are all influenced by brain theory. 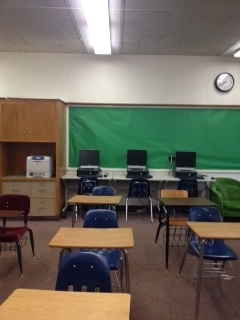 My classroom is beige with green accents. I do not put up boarders or tons of posters around my room because I find them to be a distraction and chaotic for my students. Green is a calming color that represents nature and the environment. I even have two comfy green chairs that students can do work in. The necessary learning tools are available to students to access: pencils, whole puncher, and pencil sharpener. Behind closets and cabinets I store additional supplies for easy access: highlighters, colored pencils, markers, glue, scissors. There are three different learning spaces in my classroom. I have adapted these learning spaces from ISTE 2015 Convention. The center of the room, the tables are in a U-shaped organization. 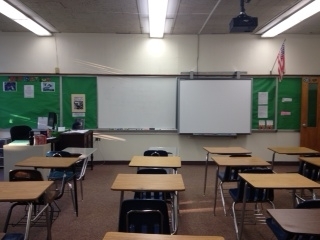 This is the space where I teach mini-lessons and face the SMARTBoard. This area is called the “campfire” where we learn from experts and participate in group discussions. In another area of the room I have set up tables in quads for small group and collaborative work. This area is referred to as the “watering hole” and this space allows me to work with small groups and even teach mini-lessons in small setting to target skill development. The walls in my classroom highlight learning outcomes, student exemplars, and book title suggestions. I have found some awesome ideas on Pinterest that inspired my Homework board and the board that posts my CCLS, Learning Goals and Essential Questions. I was also inspired by Pinterest in revising my syllabus for this school year. And took my template from Everyone is a Genius Blog. I got a ton of positive feedback from parents and my principal about this document. For Back to School Night, I shared these slides to give parents additional insight in my classroom teaching and philosophy. Differentiated Instruction IS . . .
Differentiated instruction that is more qualitative than quantitative. Differentiated instruction provides multiple approaches to content, process, and product. Differentiated instruction is student centered. Differentiated instruction is a blend of whole class, group, and individual instruction. Differentiated instruction IS NOT . . .
Teachers can differentiate through: Content, Process, Product, and Environment according to Students’ Readiness, Interests, Learning Profiles through a range of strategies such as multiple intelligences, jigsaws, graphic organizers, RAFTS, tiered assignments, leveled texts, think dots, numbered heads, cubing, learning centers. The goals of a differentiated classroom are maximum growth and individual success. When planning and created differentiated activities and assessments, focus on the learning outcomes. What learning do we want student to demonstrate? Offer students choices or choose their own creative ways to demonstrate their understanding and apply it in new situations. I have written about and shared activities throughout this blog that I have created to differentiate from different versions of Roll the Dice activities where students select reading comprehension questions based on “I read it and I get it” or “I read it but I don’t get it.” I used learning stations often and offer choices on 75% of the assessments students complete in my classes. Differentiation should be the norm in classrooms today in order to help all students reach excellence. This Monday the students started school and this week has been exciting and exhausting at the same time. I am trying to get used to a new schedule in addition to teaching all 8th grade English classes. I thought that I would show you what my classroom looks like so that you can see the ways that I am using space and design to promote literacy among my students. I have spent a lot of time on Pinterest looking at images of other classrooms for ideas and inspiration. You will notice first that green is my color this year. I believe in brain compatible learning and that means the environment and color influence student learning. Green is a calming color and since my classroom is right off of a courtyard, we have a very green landscape to look out onto (for now). I stick to one color as not to excite or distract my students. I have brought in green two chairs I got from my aunt for conferencing and group work in a space I call the “Literacy Lounge” in the back of my classroom. 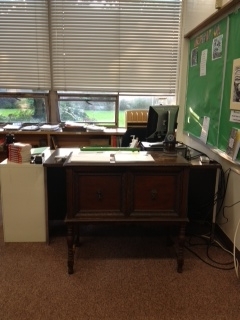 I am awaiting new desks that are more conducive to cooperative learning but for now we work with what we have. 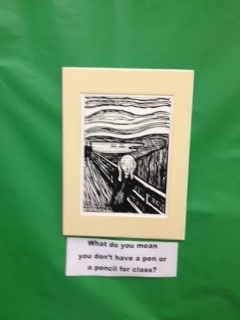 The walls are a little barren right now since I want to fill them with wonderful student work. A view of my classroom looking towards the back below. Yes, we are probably one of the few schools left that has old desk top computers. But at least after classes are over students can come to the classroom to work online and add stuff to our class Wiki. 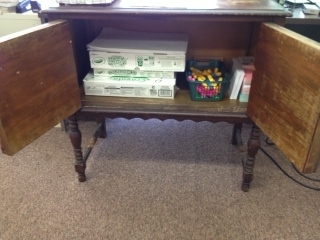 In front of the “teacher’s desk” I have this antique side table also from my aunt that I use to store materials like markers, highlighters, note cards, and more. It helps to keep things neat and organized and so that the classroom doesn’t look so cluttered with teaching tools. 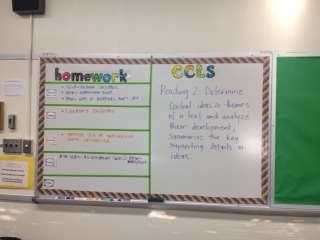 My homework board also allows me to highlight the Common Core Learning Standards we are working on at the current moment. I used rainbow duct tape to create a border for the outside of the white board and then green duct tape to outline the homework board which is color coded for the days of the week. The entire wall of my classroom looking out on the courtyard is book shelves. They are very sparse as I begin to establish a classroom library, but I am adding to them daily. I have created some bins for books that I will group together thematically. 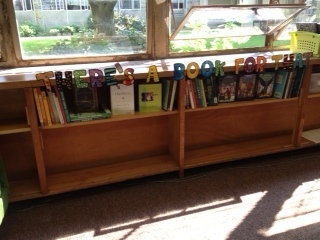 I took the line from middle school teacher and blogger, Erin Cobb of I’m Lovin’ Lit “There’s a book for that” to highlight the book shelves and the books that I showcase in our classroom library. For my first student teaching placement back in 1995 while attending Syracuse University I had the opportunity to work with an amazing middle school English Language Arts teacher, Mary McCrone. Her classroom was warm and inviting, with desks set up in clusters and plants all around the room. She brought in lamps and never used the glaring overhead florescent lights. In the back of the room she had a rug with two large couches facing one another a person might think he or she was in someone’s living room rather than a classroom. Chalk boards were covered with paper and classical music played softly throughout the day while students completed a do now or did independent writing. Mrs. McCrone would ring chimes to call the class to attention. What I learned during that student teaching placement shaped the teacher that I am today. Mrs. McCrone classroom followed an ITI methodology – Integrated Thematic Instruction, now known as the Highly Effective Teaching model. ITI was developed by Susan Kovalik in 1984 and is based on brain compatible learning. I went through Mrs. McCrone’s ITI training to understand and implement brain compatible learning during the time of my student placement. Many of these elements I still use in my classroom today. Over the next few weeks I will address each of these elements in a blog post and share what it looks like in action, in my classroom. As summer approaches and teachers begin thinking about revising for next school year, creating a classroom where students achieve and cultivate a lifelong love of learning is a priority. Think about how you can make your classroom and teaching more brain compatible. Susan Kovalik stated, “It is essential to know how the brain learns if we want to produce students who are capable and competent in all of their subjects” (2008). There are many websites and resources on what is brain compatible learning and how brain research can be integrated into the classroom, as well as how brain research relates to technology integration. One of my favorite books about brain compatible learning is Eric Jensen’s Teaching with the Brain in Mind (2005, ASCD). For a more resources and websites about brain compatible learning click here.